by Tony Bruguiere | Ft. Collins, Colo. The traditional Cattle Drive which marks the start of the 116th Cheyenne Frontier Days moves south along I-25 much to the delight of travelers from eastern states who now have a unique memory of their time in the western portion of America. Here they come! Five hundred of the 1,300 prime Corriente steers that are used in the Cheyenne Frontier Days Rodeo are driven over the hill from their pasture north of Cheyenne to the pens at Frontier Park. This is the official kick-off to the 116th annual Cheyenne Frontier Days Rodeo. The steers are driven the eight miles to the Park along the I-25 service road, much to the delight of onlookers along the route and north bound cars on the interstate. The Cattle Drive is the traditional and official start to Cheyenne Frontier Days, but the rodeo does not actually begin for another week. The six days of free admission timed-event slack start on July 18, and the rodeo and concerts start on Saturday the 21st of July, but to the local Cheyenne area volunteers, this is the culmination of all the work that they have put in since the 115th Frontier Days. Before moving the cattle, Committee Chairmen, Dandies, wranglers, volunteers, guests and family gather for a chuck wagon breakfast and some socializing before driving the cattle to the rodeo pens at Frontier Park. When everyone has had their fill of a hearty breakfast of sausage, eggs, and biscuits and gravy, all cooked to perfection in Dutch Ovens, the real work of moving the timed event steers to Frontier Park begins. 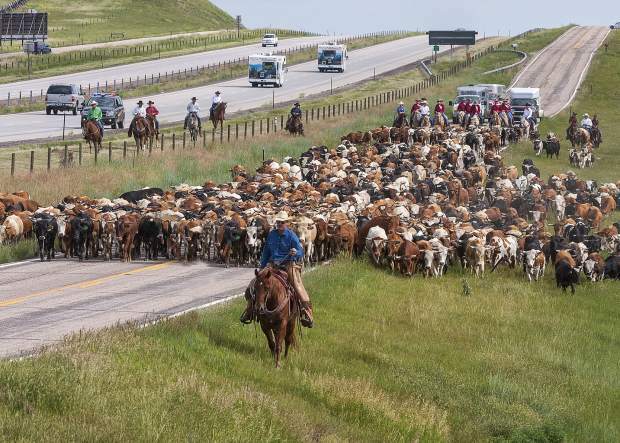 The annual Cattle Drive is a highly anticipated event not only for those that participate in the drive, but for all the people that line the route to Frontier Park. The drive starts north of Cheyenne and runs south on the service road, parallel to I-25 and eventually winds its way to Frontier Park. It is quite a procession with vintage wagons and buggies loaded with media and guests leading the way. Next comes Miss Cheyenne Frontier Days and the Lady in Waiting, followed by 500 Corriente steers. The Committee Chairmen bring up the rear and the whole procession is surrounded by cowboys that keep the steers together and moving forward. The Wyoming Highway Patrol takes care of keeping traffic moving along I-25. It is always interesting to see that the cars from Colorado and Wyoming hardly slow down, while the cars bearing plates from eastern states slow to almost a crawl.